Silver coin Wiener Philharmoniker 1 oz is the most desirable European silver investment coin, minted by the Austrian Mint Münze Österreich AG. This silver coin has been minted since 2008. The obverse side depicts the great organ in the Golden Hall of the Vienna Musikverein concert hall - the seat of the Vienna Philharmonic, together with the year, the weight (1 UNZE) and the nominal value of the coin (1.50 euros). Wiener Philharmoniker is the only investment coin with the nominal value of the euro. 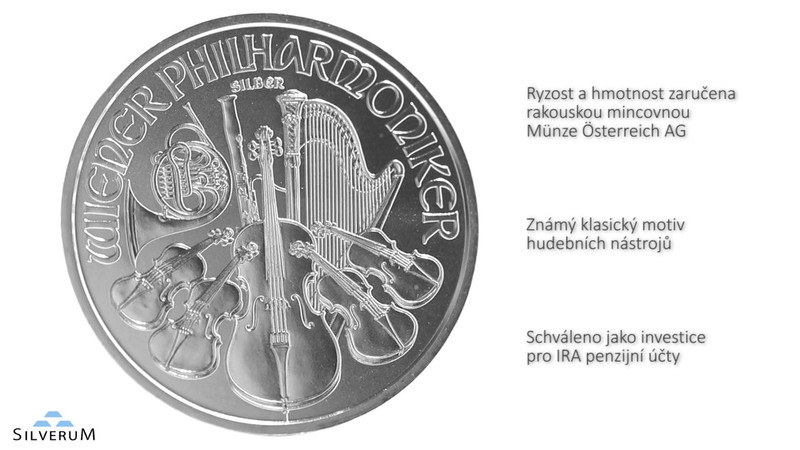 The reverse side of the coin depicts Vienna Philharmonic Orchestra instruments such as cello, violin, harp, French horn and bassoon.